Hello friends! Good morning to ya! I have good news! In case you haven't heard, Katie King from Queen of the First Grade Jungle is moving to the wonderful world of 2nd grade - Hooray! I'm so happy that she's going to be joining our little circle of 2nd grade bloggers. She is seriously awesome! So to celebrate, we are offering you, no joke, the easiest giveaway in the blogging world! 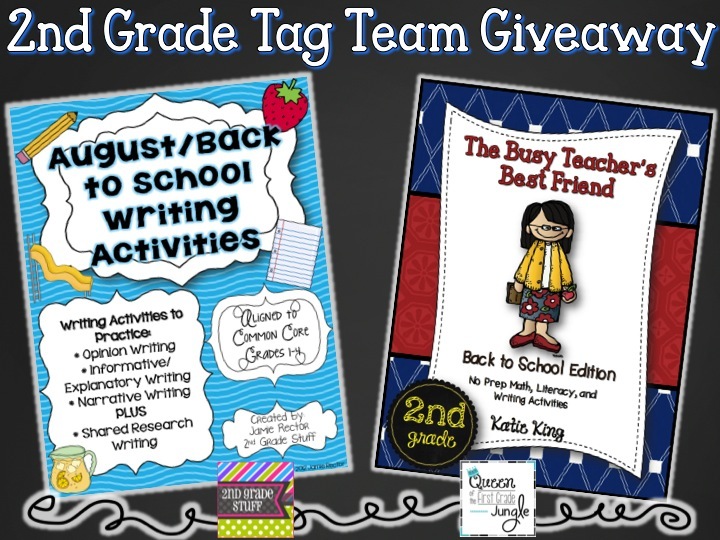 We are tag teaming to give away a copy of her 2nd Grade Busy Teacher's Best Friend pack and a copy of my August/Back to School Common Core Writing Activities. Katie's Busy Teacher pack is so useful for morning work, quick printables, homework, or even sub plans and I'm so happy she is now making them for 2nd grade! Good luck! The winner will be announced on Sunday at 9:00 pm CST right here on my blog and on my Facebook Page. Have a great weekend! I loved my second grade year! It is such a fun grade! Would love to be a winner! Wow! I guess you found the EASY button!Thank you! Yahoo! I love EASY! Thanks so much! Super easy, would love to win! Both of these packs look wonderful! Thanks so much for the opportunity to win! I just recently discovered all these second grade blogs. You all are amazing and full of such great ideas. Thanks for sharing. Just discovered your blog and it is amazing! I will be going back to work this year for the first time since 2006 so this is awesome. I would love to win these wonderful packs. Congrats! 2nd is the best grade IMHO. That is great news, enjoy second grade! I am so excited that Katie is moving to second grade! I made the switch from first to second last year and I haven't looked back yet! I would love to get my hands on both of those packs! Second grade is fabulous and this giveaway is pretty fabulous too!! Wow! This is great! I could sure use all the help I can get because this year I am teaching 2nd (self-contained) after 10 years of teaching 3-5 math (departmenatlized). Best wishes to everyone for a great year! Stop by my blog when you have a chance! Awesome packets!!!! I would love to have a copy of these packets. Both look like great packs! Thanks for the giveaway! Oh my word! I would love either of these packs! They would be perfect for the beginning of the year. I am a follower of both blogs AND a fellow 2nd grade teacher. I would love to win these packs they look FABULOUS ! I love your blog!! I would love to win one of these!! Yay! A new second grade blogger to start following! Can't wait!! Sorry, forgot to add my name. It's Courtney B! This is awesome! I'm teaching 2nd grade for the first time this year! Thanks for making this giveaway so simple! This is great! I am starting my 21st year and will be in second grade again. Thanks! These 2 packets are fantastic! As a brand new second grade teacher, I would be so excited to win these second grade materials! Thanks so much for the giveaway! Just starting tho think about back-to-school. Finishing my second week and hoping to win these two amazing prizes!!! These products look awesome - east to use and full of great activities! Thanks for hosting these 2 back to school packs. Katie will rock 2nd grade! I love reading second grade blogs! Welcome Katie! WOW It looks wonderful. I would love it to use in my first and second grade room! Especially since I'm still unpacking 200 boxes from my room moving after many many years! Super easy AND Super Useful!!! Wishing all you 2nd grade teachers a fantastic year! Thanks for the offer...hope I win! I'm brand new to 2nd Grade. I'm excited and nervous all the same time. I'm super blessed to follow great 2nd grade bloggers :). Excited for my second year of teaching second grade! I think it will be golden! I absolutely love your blog! I am a first year teacher and am so excited to be teaching second grade!!! I have gotten tons of great ideas from you and this giveaway is awesome! Love it! Ready for some more 2nd grade resources!! Wow! It looks great! Second grade is wonderful. Best of luck this school year! Second Grade is the BEST because of all the HUGS!! Love these packets! They are already on my wish list. Would love to win this! First year in 2nd and I'm overwhelmed! After 4 days of district PD and a mad rush to set up my room, EASY is just what I needed! The kids start on Tuesday, ready or not! I just moved from 4th to 2nd! I'm super excited to teach 2nd this year! I am loving seeing all the amazing ideas! Thank you for offering such a generous give-away! They are beyond appreciated....you know what teachers get paid vs. what we spend on our classrooms!!! I'm new to 2nd grade and would love this! Thanks again! Fantastic! Thanks for the opportunity! Thank you and would love to be a winner! I have used several of your writing activities, and they are great! I'm glad to have found (and be following) your blog! I am looking forward to checking out Katie's too! These packs look AMAZING! Love the writing activities!!! You have some incredible ideas for 2nd grade!! I was really inspired by your post of the daily 6 centers that saved your classroom... Thanks!! I'd love to be a winner! Thank you for all the ideas and inspiration. I am looking forward to my second grade adventures this year :) Love reading your blogs, keep the great ideas coming. This will be my first year in second grade too!! Looking forward to the adventure! Wooo-hooo! I'm all for easy! Moving to second, too! I'm FINALLY getting to move back to 2nd and would definitely love to win these super cute packs! Thanks for making it so easy! Those look like great resources! I am so not ready for back to school. But your awesome blog is helping! Thanks! I moved from 1st grade to 2nd grade 6 years ago...I love second! Never want to go back! What a lovely packets you are giving away! I would love to win them. These are awesome! I hope to add this to my collection! I would absolutely LOVE to win these!! I am moving back to second after a three year stint in third and I am thrilled!! These look GREAT!! Here's hoping! These look wonderful! I'd love to win these to help me start off my year! Thanks!! Love your blog! Thanks for all the wonderful ideas! Thank you for hosting such an easy giveaway! This will be my first year as a 2nd grade teacher and this would be so helpful to have! Second grade is so much fun to teach! I hope Katie will enjoy it. Thanks for hosting this giveaway. I am so excited to be entering the world of second grade as well! I will be looking to both of you for inspiration, as I have been a 4/5 teacher! I'm new to 2nd grade this year. I have a full set of First Grade Busy Teacher packets. I would love to start my Second Grade collection. I would love to win these packets...needing to step up our writing game! Finally, something easy about starting the school year!! Second grade is great. I have been teaching second grade for 28 years. I would love to win! I enjoy reading your blog. Thanks! Love your blog and love your materials! Glad I found your blog! Hope that I win! I'm a first year teacher and need all the help I can get! Getting my teaching license at the age of 40 doesn't seem like such a good plan sometimes. Help a sister out!! I love teaching second grade and think this would be a great addition to my resources! I would love to win! I would love these!! Friday was our second day in second grade this school year. I love any resources I can get! I am a first year teacher and would love this resource! Thanks for all of your great ideas! Just moving to second grade this year after teaching kinder...would love to win these!!! wow! This is super awesome!! Wouldn't be nice if I won since I didn't win the lottery, lol. New to 2nd and looking for the help I can get. Wow! Thanks for the giveaway. Yes! This is a great giveaway! Thank you! Happy to follow both of you!! OMG! Would love to win. Thanks for the opportunity. I am a first year teacher and I am lucky enough to teach 2nd grade this year! I am a little nervous and really excited. These would help me a lot in my new adventure!! Wow! I would love to have some new ideas for a new year! This marks my 30th! Love your blog! I'm about to make the move from 1st to 2nd!!! Would love these to help with the transition!!!! This is awesome! I love my second graders! Thank you! This will be my 2nd year of teaching 2nd grade! Back to school goodies would be great! Thanks! 2nd year in 2nd grade - would love more resources that I could actually use! Love second grade and love your blog! I am changing schools, towns, and hrade levels! Would love to win. I'm moving from first to second this year as well! I'm excited about it. I am a brand new teacher-teaching 2nd grade ELAR in Texas-I am super-excited and glad I found your blog! I love your blog, it has really given me some great ideas for my classroom. This is my second year teaching 2nd grade and all help is appreciated! Wow, these bundles look great!! Fingers crossed and hope everyone has a great year! Both these resources would be great to start the year off. These packs look great for the new school year!! !